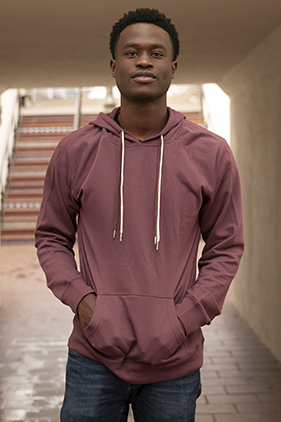 6.5 oz (220 gm) cotton/polyester blend fleece. Cotton/Polyester blend 24 singles face yarn. Unlined hood. Split stitch double needle sewing. Twill neck tape. 1x1 ribbing at cuffs & waistband. Metal eyelets. Slim fit.